Am I the only one who is ready for this Winter to be over? Spring Break is right around the corner and we still have freezing temperatures here!! This week we have been looking at the ugly, freezing, dark skies and rain. We wanted to turn it into something beautiful! Begin with a white crayon and draw the horizon line. there should be a big emphasis on drawing OVALS instead of circles. Students figured out that you can see the white crayon BETTER when the paper in on their stool UNDER the table! So I let them draw on their stools! Can you see the white crayon in the picture? First, paint some large blue "blobs" on your paper. Then paint around the blue with black and watch it blend with the blue and the wet paper!! 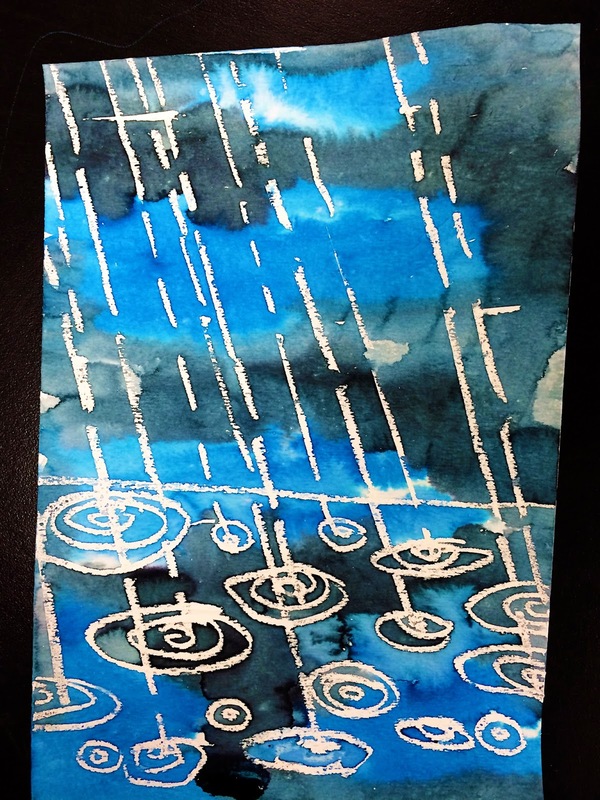 I have some siblings at my school working on a special project and they painted the background with the rain idea and it turned out great! Love this effect - I'm a big fan of rainy days. Think I'll pull this out for April showers! Do you dilute the paint in any way? I love how vibrant the colors turn out! Cool idea. It would be so fun to take photos of kids holding an open umbrella or wearing big rainboots and have them add the cut out on top of the dry painting! Love it! I don't dilute the paint, I wet the whole paper with a rag right before they paint to make the wet on wet effect. I like the picture idea too, that would be VERY cute!! 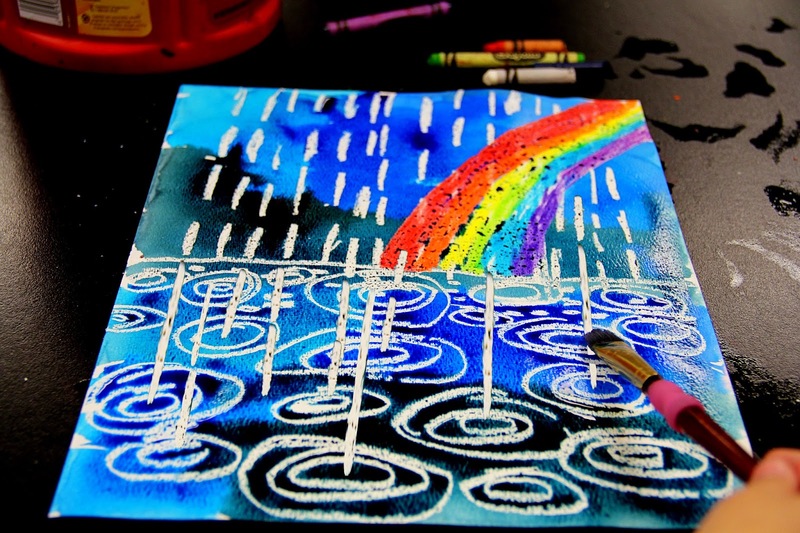 Even once watercolor paint has dried, it remains water soluble. You can re-wet the dried paint with water on a brush and it will 'turn' back into paint. This means you can lift the paint off the paper to fix a mistake, lighten a color by removing some of it, or even mix it with new paint. Hardly wait for spring to do this! I love the colours! What kind and size of watercolour paper did you use? Hi Natalie, what a great blog, thanks for sharing wonderful ideas :) Have used soluble watercolours with my class but colour lacks intensity so I painted over with PVA hoping to get a glossier finish - no luck. Maybe the paints are of different quality (colour is a lot like what you get from Edicol vegetable dyes and I'm wondering if they're the same??). Yours are so lovely and bright. What if I painted over with Liquidtex? Would this give a sheen and more intensity to the colours? The only other thing I've used is artist's inks which have gr8 colour and a glossy sheen but they're very expensive. Any tips? Thanks heaps. What kind of paper did you use? Looks awesome! Какая чудесная работа! Спасибо за идеи! 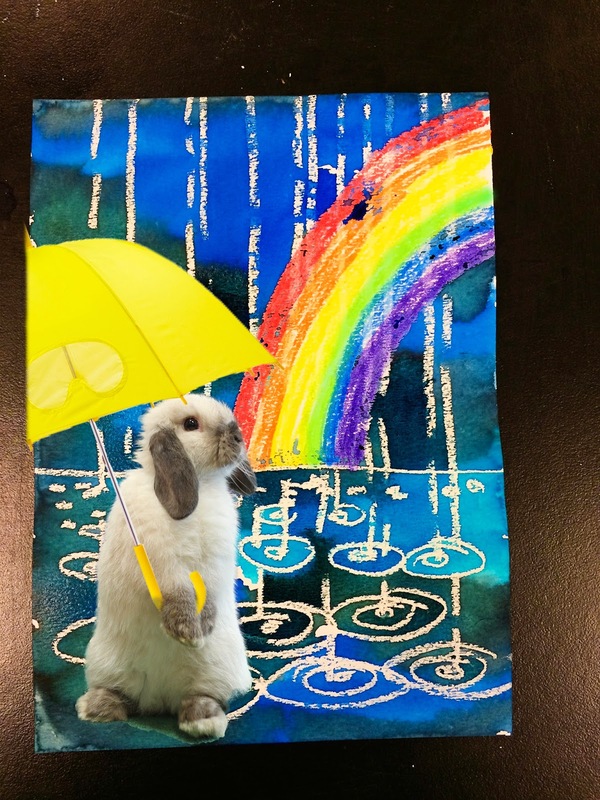 Where did you get the bunny with the umbrella? Offers similar advantages as RAID 1 taking it up another notch with the striping across disks. free hard drive cloning software download I am assuming that if you are concerned about higher simultaneous reads, you will also be using multi-processors/multi-cores. You will be processing multiple queries at once.